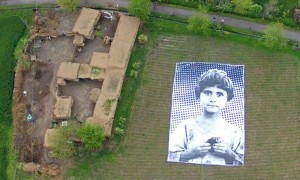 Inspired by the French photographer JR, who installs hugely magnified portraits of local people in the landscape, a group of artist-activists travelled to Khyber Pakhtunkhwa, the scene of a US drone attack last November. With them they brought a giant poster of an unnamed child who is said to have lost both her parents and two younger siblings in one of the attacks. Having secured the agreement of local people, they unrolled the picture and fixed it flat on the ground in a field beside a group of houses. The number of civilians so far killed by drones remains a matter of intense debate, but the worry among campaigners is that this kind of warfare makes killing unpleasantly easy. Operators have compared the experience with playing a computer game, and a Rolling Stone article in 2012 recorded their use of the term “bug splat” to describe the mess on the ground that killing someone leaves behind. The artists have chosen #NotABugSplat as the project’s name. The intention now is that any drone operator who looks down through their camera and sees this village will have reason to think twice. In their own words, the artists hope the image “will create empathy and introspection amongst drone operators, and will create dialogue amongst policy makers, eventually leading to decisions that will save innocent lives”.